Since 1862, “Taps” has played at military funerals to honor the sacrifice of fallen service members. Originally, however, it was intended to send soldiers off to a less permanent sleep. During the Civil War, Union buglers signaled “lights out” to their comrades with a tune called “Extinguish Lights,” which was actually borrowed from an 1809 French bugle call (which also happened to be Napoleon’s favorite). Finding the song too formal, in July 1862 Union Army General Daniel Butterfield (Third Brigade, First Division, Fifth Army Corps, Army of the Potomac) decided to find a more appealing tune to end the day. During a respite while his brigade was camping at Harrison’s Landing after the Seven Days Battles of the Peninsular Campaign, Butterfield worked on the new tune. General Daniel Butterfield . . . sent for me, and showing me some notes on a staff written in pencil on the back of an envelope, asked me to sound them on my bugle. I did this several times, playing the music as written. He changed it somewhat, lengthening some notes and shortening others, but retaining the melody as he first gave it to me. After getting it to his satisfaction, he directed me to sound that call for Taps thereafter in place of the regulation call. The music was beautiful on that still summer night, and was heard far beyond the limits of our Brigade. The next day I was visited by several buglers from neighboring Brigades, asking for copies of the music which I gladly furnished. I think no general order was issued from army headquarters authorizing the substitution of this for the regulation call, but as each brigade commander exercised his own discretion in such minor matters, the call was gradually taken up through the Army of the Potomac. As for how it got extended to funerals, “Taps” was first played at a military funeral during the Peninsular Campaign in 1862 on the orders of Captain John C. Tidball of Battery A, 2nd Artillery. Taps formally became a mandatory part of Army funeral ceremonies in 1891, perhaps in part because General Butterfield, now retired, oversaw the funeral of General William Tecumseh Sherman (also in 1891). 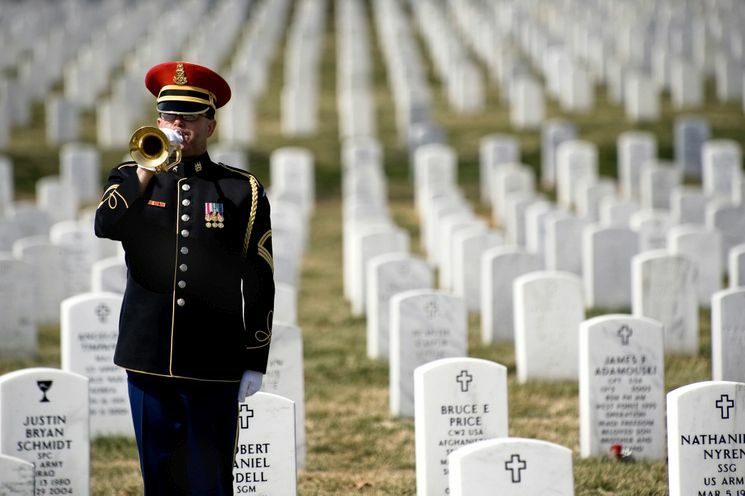 As part of the 2013 Defense Authorization Act, Congress designated “Taps” the National Song of Remembrance. At the turn of the century there were thousands of performance buglers in the military and even organizations like the American Legion, Boy Scouts and Veterans of Foreign Wars . . . . But these days, young boy buglers are all but gone, and one of the first things to go with any cuts in the military are things like bands, where the buglers come from.